Defense Minister Moshe Yaalon speaks to reporters after talks with visiting US Defense Secretary Chuck Hagel. 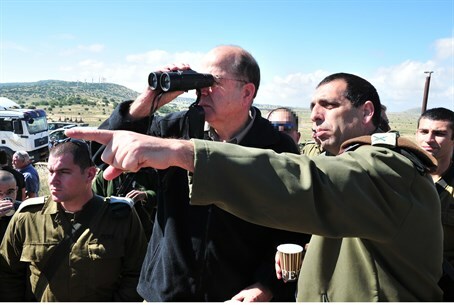 Defense Minister Moshe Yaalon said Thursday that the Jewish state and its US ally should be prepared to use "all means" to prevent Iran from obtaining a nuclear weapons capability. "I believe that it should be in the first priority of each of us to deal with this threat by all means, in all fields," Moshe Yaalon told reporters after talks with visiting US Defense Secretary Chuck Hagel. "We might have differences, even disputes regarding how to get it [done], but we have the open channels, the secretary of defense and myself. The bottom line is that Israel should be ready to defend itself, by itself." Hagel said the negotiations between the powers and Iran were not open-ended – the parties are working to a July 20 target for an agreement. Hagel was on the last leg of a Middle East tour that also took him to Saudi Arabia, which has its own concerns about the nuclear talks with its regional rival. Arutz Sheva strategy analyst Mark Langfan noted that Israel and Saudi Arabia are forming a suprising security alliance, faced with an American policy of entente with Iran.